Tom Barker and Tony Souders after their five round war. The Knights of Columbus Hall in De Soto, MO was home to Gateway Fight League on Saturday night. The GFL showcases the best amateurs in Jefferson County from the best schools south of St. Louis: Team Defiance, Hahn MMA, Team No Remorse, and Team Destruction. Headling GFL:7 was undefeated phenom Alex White, and he did not disappoint. The fight card featured 15 exciting fights, and the rowdy crowd got worked into a frenzy by the end of the night. *Brian Keath scored a TKO victory in just 32 seconds. *Justin Jovanovic submitted his opponent in just 19 seconds of round one. *Justin Werts and Brandon Aubuchon put on an exciting match that saw both fighters winded yet slugging away. *Bo Kunz smothered his opponent with punches getting a quick TKO in round one. *Ronny Harper submitted his opponent quickly and looks to be a star on the rise. *Malcolm Smith looked impressive closing the distance quickly and a fast TKO. *Tom Baker and Tony Souders went to war and had the fight of the night. Tom won the first two rounds with dominant wrestling and good ground and pound. Round three saw more of Tom Baker before he was hit with heavy punches from Souders. Somehow how Baker survived the late onslaught of Souders in round three. In round four, both fighters were breathing heavily, but that didn&'t slow them down from throwing heavy leather, big shots landed by both. This round brought the crowd to their feet where they stayed for the rest of the night. In the final round that could have been an even fight on the scorecards, Tom Baker continued to press forward absorbing big punches in the process. Unfortunately too many got through and the ref had seen enough to stop the fight, giving Tony Souders from No Remorse MMA the victory. This fight was incredible. *Dan Baynton submitted Mike Green with a lightning quick armbar from the bottom. 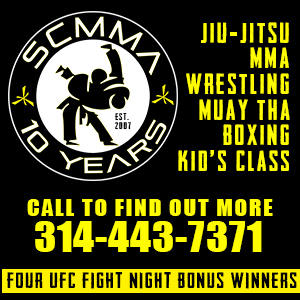 *St. Charles MMA&'s Adam Meredith beat a very game Jake Beuhler with better wrestling and a good transition into a rear naked choke. *In the Main event, highly-touted prospect Alex White (14-0) took on "The Groundshark" Cory Hunter. White started off the fight with kicks. Hunter was able to catch one and take White to the ground before they both scrambled to their feet. White connected with a crazy head kick that seemed to really piss off his opponent. White ended round one with vicious shots to the ribs of a grounded Hunter. White has very heavy hands for a smaller fighter. In round two, Hunter worked the muay thai clench, but absorbed some heavy punches doing so. Eventually Hunter gets the take down which White quickly reverses. 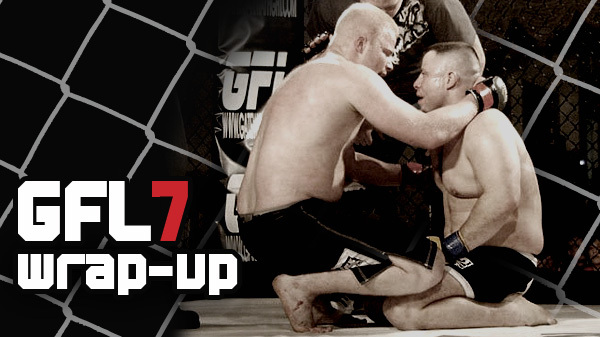 From the top, White lands more big shots before finally taking his opponents back and getting the rear naked choke. After the fight Team Destruction coach Joe Worden announced Alex White will be dropping all of his amateur belts and turning pro in the new year. Jimmy Mann and the Gateway Fight League put on a competitive and exciting amateur fight card. Their next show will be January 21st.